3180 Tank Truck is a City set released in January 2010. It includes one Oil Tanker Driver Minifigure. This set was released December 30, 2009 in the UK and was released sometime in June 2010 for the US. This set is similar to the first Octan tanker that LEGO made in 1992, 6594 Gas Transit, though slightly bigger and more realistic. This is the first set that contains Octan "Energy" sign. 7747 Wind Turbine Transport and 60016 Tanker Truck also have Octan Energy logos. The trailer is detachable from the truck, and has an extendable fuel hose and positionable landing gear. The truck has opening doors and a removable roof. This set also contains a small fuel pump station. This is a description taken from LEGO.com. Please do not modify it. (visit this item's product page) Keep LEGO® City on the move! 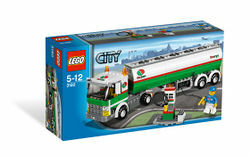 Help keep the cars, trucks and airplanes of LEGO City moving by transporting gasoline to all the gas stations in town. Fill up the fuel pump with the truck’s extending hose line, or use the dispenser to fill the Tank Truck’s own gas tank to keep it rolling right along! Includes truck driver minifigure. Use the extendable hose to fill up the fuel pump! Facts about "3180 Tank Truck"
ShopDescription Keep LEGO® City on the move! Keep LEGO® City on the move! This page was last edited on 9 February 2019, at 17:26.